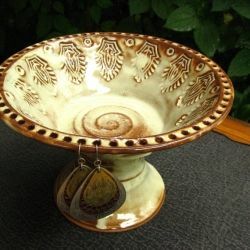 My favorite ceramics and pottery artist, Tracy Shea, lives in Garrettsville, Ohio which is not too far from Cleveland. 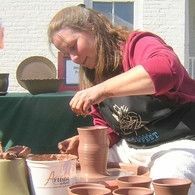 Tracy has been making pottery for most of her life, and she is an expert. 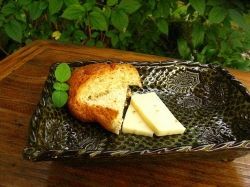 Tracy specializes in pottery that is meant to be used for food or display, and all of her pieces are food safe, and able to put in the microwave and dishwasher. This makes them very practical. While I have to admit that the practicality is one of the things that I love (I am constantly putting my mugs in the microwave and dishwasher), it is the beauty of her work that keeps me coming back. As you look down this page, you will see what I mean. Each piece is lovingly created, with its own personality, and the texture and colors are just incredible. 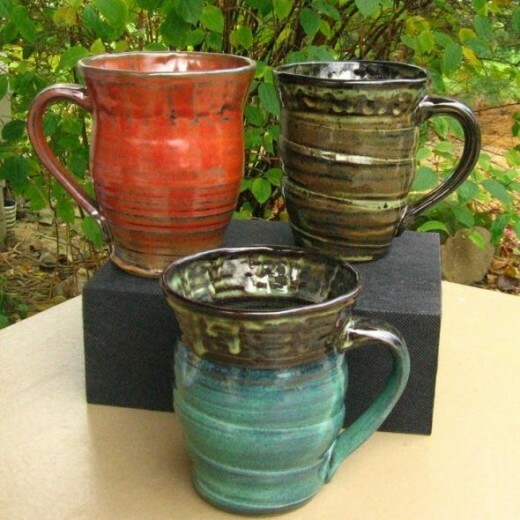 You can order pottery from Tracy Shea through Lake Erie Artists Gallery. 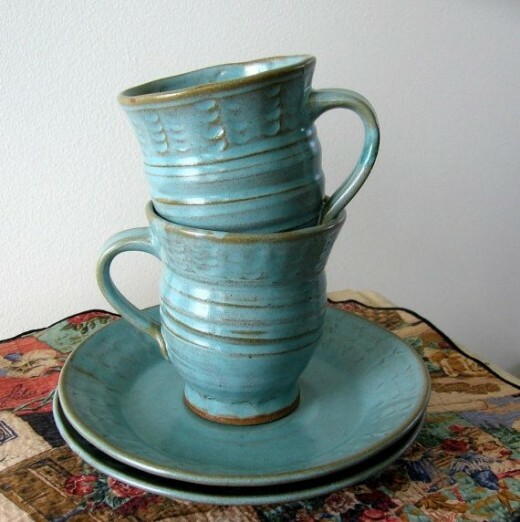 A Selection of Tracy Shea Mugs - These fit in your hand well, and are great for soup or coffee. 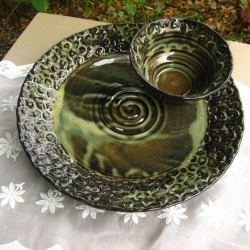 Tracy makes her own glazes, and is constantly experimenting with color, and design. You can see some of the range of glaze colors here. As a gallery owner, I work with many types of artists. Tracy Shea is one of my favorites, because she is easy to work with, and willing to provide me with what customers are looking for to the best of her ability. She is a working mom, and divides her time working at home, teaching pottery classes, and taking care of her family. 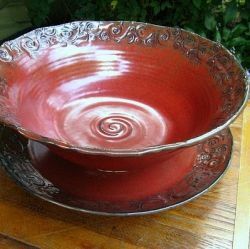 Tracy's work is beautiful, and we sell many of her larger pieces like the bowl to the right as housewarming, engagement, and wedding gifts. They are reasonably priced, ranging from $20 to $150 depending on the size of the piece. In the last year, I have ordered more and more matching sets, like this matching tea cups and dessert plate set. These make lovely gifts for friends or family, and each pair is under $45.00. I love the teal color on this set. Besides food items like mugs and bowls, Tracy also makes decorative display items, and functional pieces like this earring/jewelry holder. 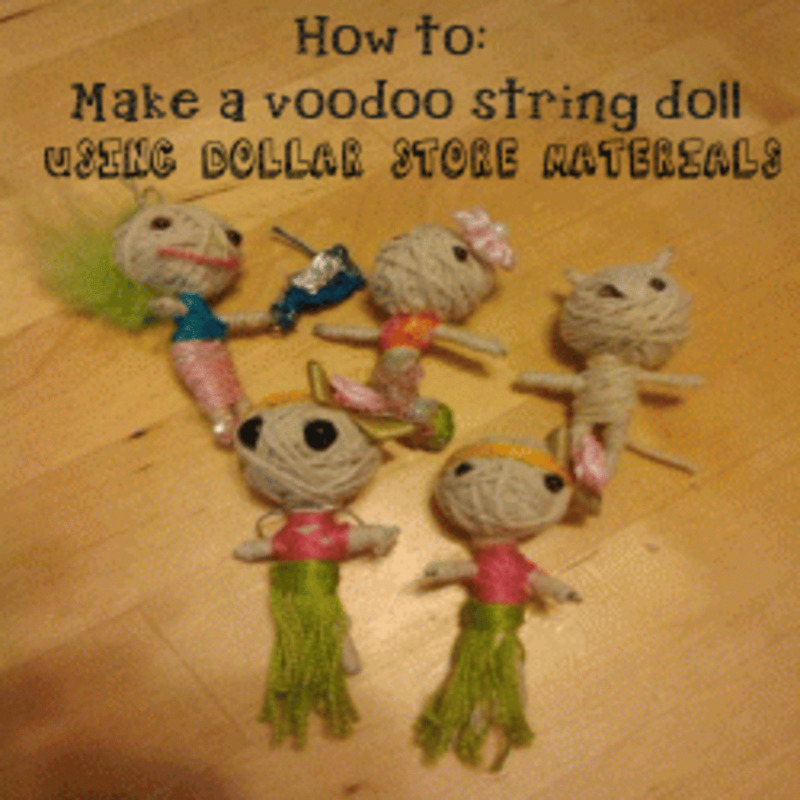 These are only about $30.00 depending on the size. 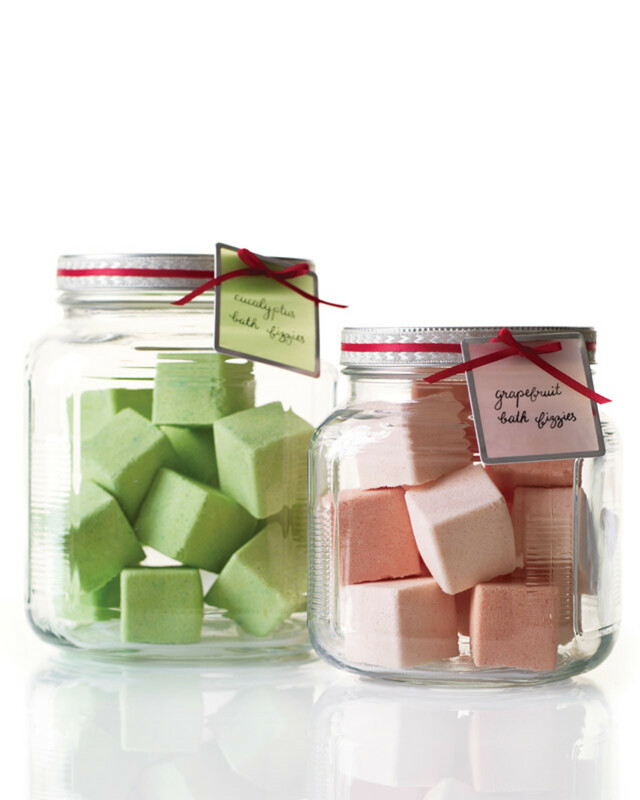 Really nice gifts for wives, daughters, or girlfriends. These trays vary in size and color, and make lovely centerpieces for a table or shelf. 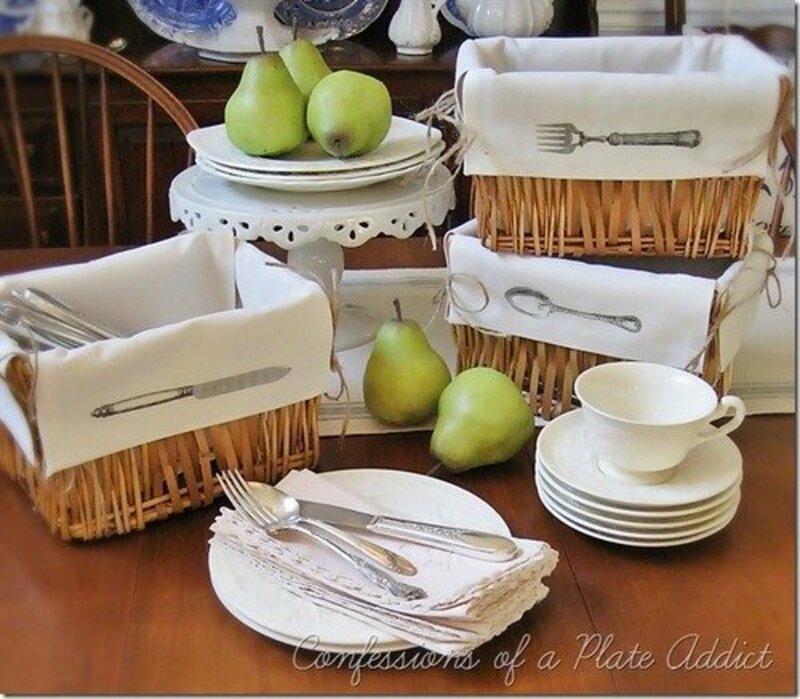 If you register with Tracy, she can make your dishware sets to order, as people order them for you, and then you will have exactly what you want for place settings. 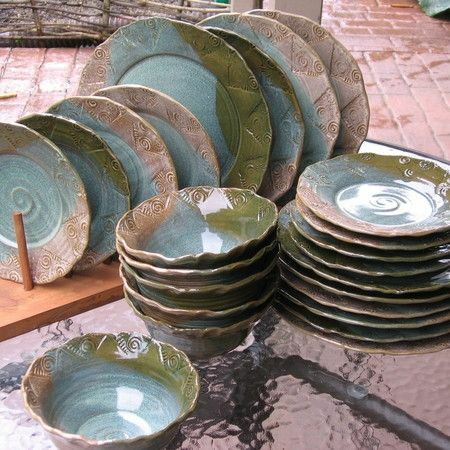 Most of this pottery is stoneware, which is very hearty, and made to be used. You don't have to worry about the fragility of the pieces. I have owned several of Tracy's pieces for several years, and none of them have nicked or broken yet. I use them all of the time, and since I am a busy working person, I wash them in the dishwasher.